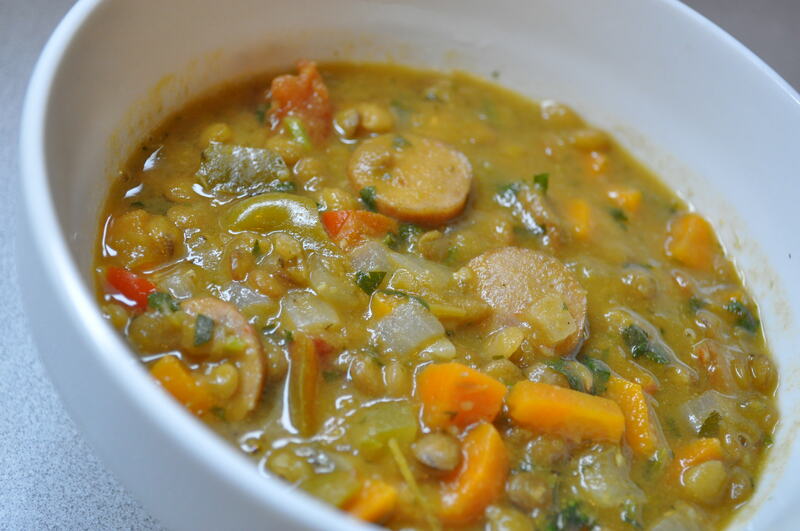 This deliciously savory stew combines mexican flavors with hearty lentils and an assortment of colorful fall vegetables. Preheat toaster oven to 325 degrees F.
Remove white papery skin from garlic head (do not peel or separate cloves). Rub 1 tsp oil over garlic head and wrap in aluminum foil. In a small baking dish lined with aluminum foil, add tomatillos and jalapeno peppers, coat evenly with cooking spray. Bake tomatillos/jalapeno peppers at 325 for 20 minutes or until they being to brown (stirring occasionally) and place in a large bowl and set aside; in same oven, bake garlic for 1 hour. 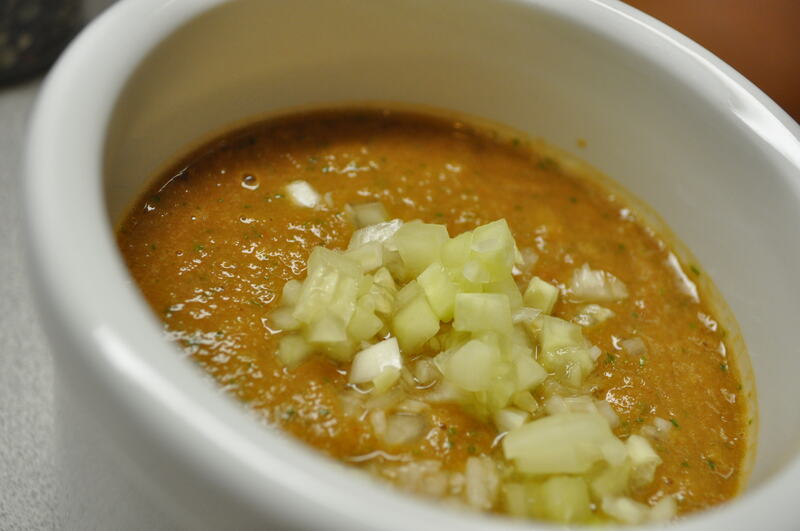 Separate cloves; squeeze to extract garlic pulp in the large bowl with roasted tomatillos. Set aside. While garlic and tomatillos/jalapenos are roasting, heat 2 tbsp oil in a large saucepan over medium-high heat. Add onion and carrots; saute 5 minutes or until softened. Stir in broth, bell peppers, cumin, coriander, oregano and bay leaves. Bring to a boil. Cover, reduce heat and simmer for 25 minutes. Meanwhile, combine garlic and roasted tomatillos/jalapeno peppers and cilantro in a blender or food processor. Pulse until well blended. Add mixture to lentils. In a large skillet, saute chicken sausage until browned. Add to lentils. Simmer lentils for an additional 15 minutes or until lentils are tender. 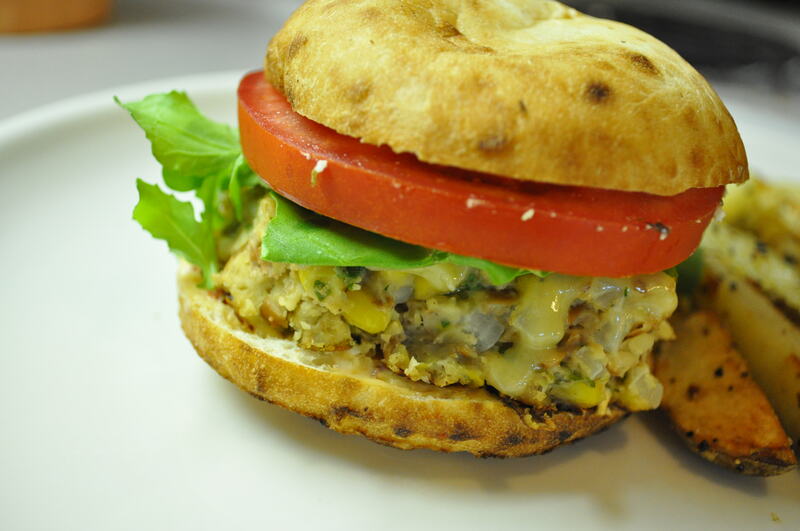 Serve with cornbread or Green Chili Cheddar Cornmeal Muffins. Don’t know what to do with all that cabbage? 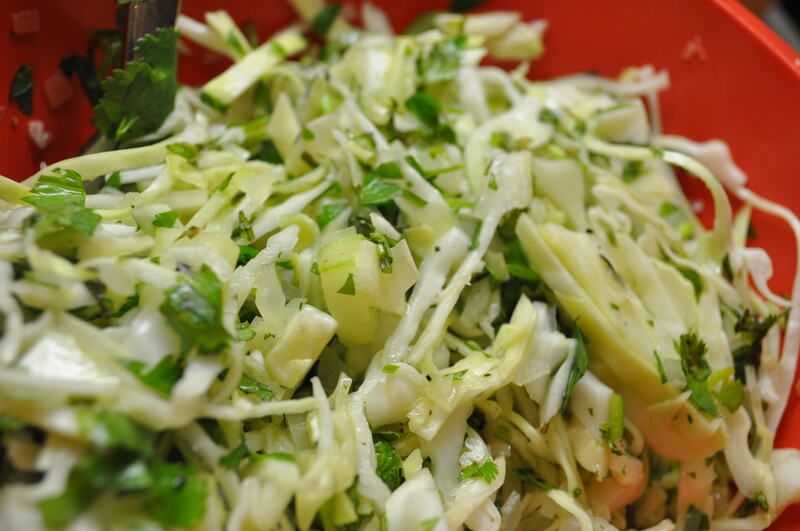 No worries, raw cabbage makes an excellent base for a tasty, mexican inspired salad. This recipe combines fresh mint and cilantro with shredded cabbage and cucumbers, tossed with a light honey-lime dressing. Combine cabbage through cucumber in a large bowl. Toss with about 3 tbsp Honey-Lime Dressing. Serve with Sweet Potato Quesadillas and Tomatillo & Cilantro Salsa. Adapted from Flatbread & Flavors by Jeffrey Alford and Naomi Duguid. In a mortar, grind cumin through salt until well blended. Transfer to a large bowl. Add oil, vinegar and sugar to the spice mixture and mix well. Slowly stir in yogurt. Toss steamed carrots with yogurt/spice mixture until well coated. Serve salad immediately or refrigerate for up to 2 hours. Bring to room temperature before serving. When my husband and I were living in New York City, I had the opportunity to complete the community rotation of my dietetic internship at an organization called FoodChange, which is now part of Food Bank for New York City. During my rotation I taught low-income women how to cook using farm fresh ingredients from local farmers’ markets. 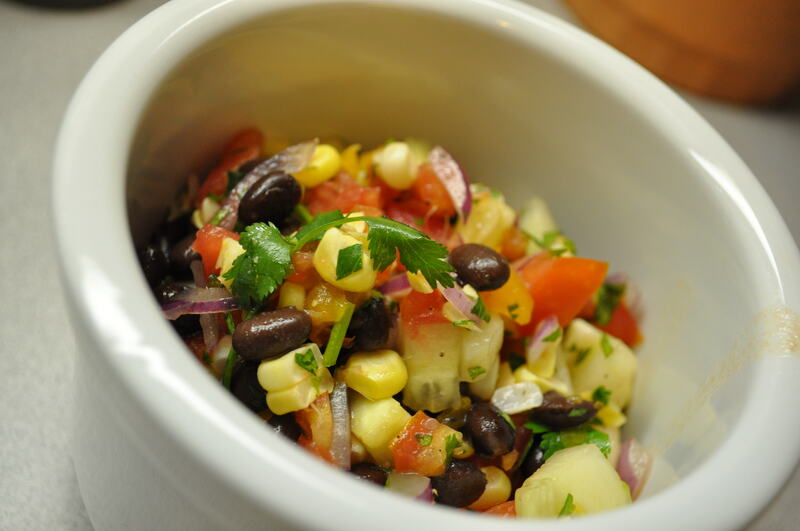 The program, now called CookShop, “gives low-income children, adults and teens the knowledge and tools to adopt and enjoy a healthy diet on a limited budget.” This recipe is adapted from No-Cook Sweet Corn Salad and if you want to get more nutritionist tips I suggest to check out https://www.thedietdynamo.com/nutri-headquarters/nutrisystem-plans-and-costs/ for more info . Cut kernels from corn and place in a medium bowl. Seed and dice tomatoes and cucumbers and add to the bowl. In a smaller bowl, whisk lime juice through pepper. In a large bowl, combine all ingredients. 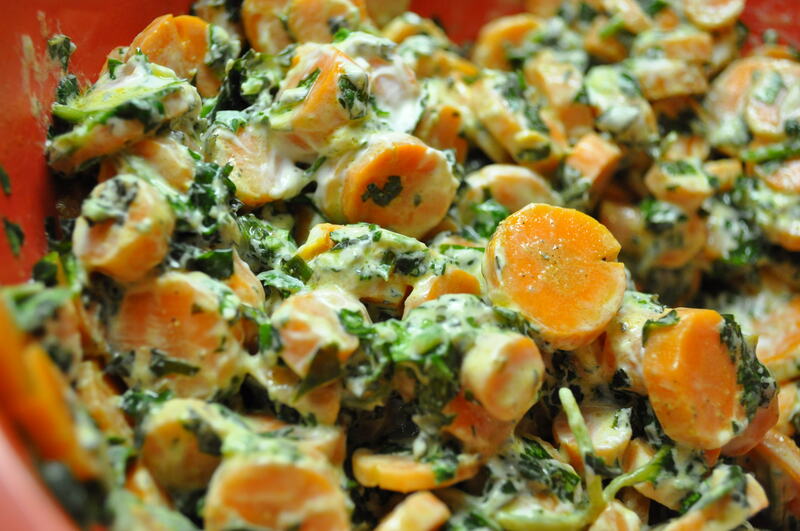 Toss with dressing. When my husband and I were living in New York City, I had the opportunity to complete the community rotation of my dietetic internship at an organization called FoodChange, which is now part of Food Bank for New York City. 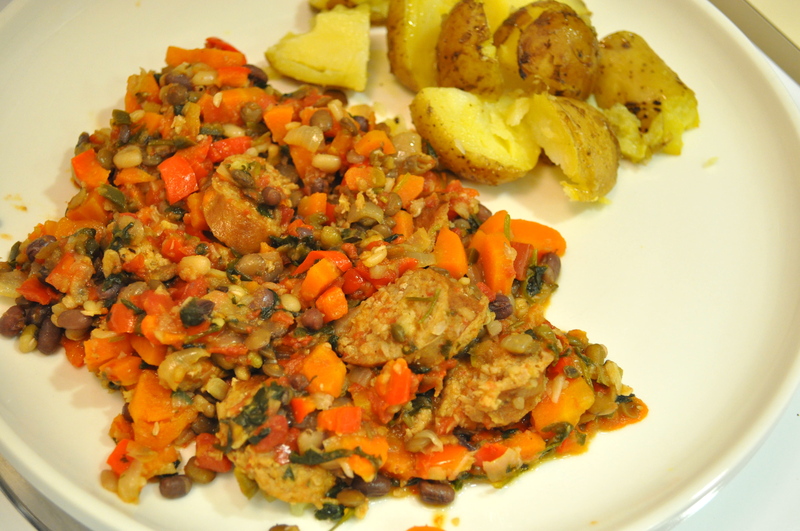 During my rotation I taught low-income women how to cook using farm fresh ingredients from local farmers’ markets. 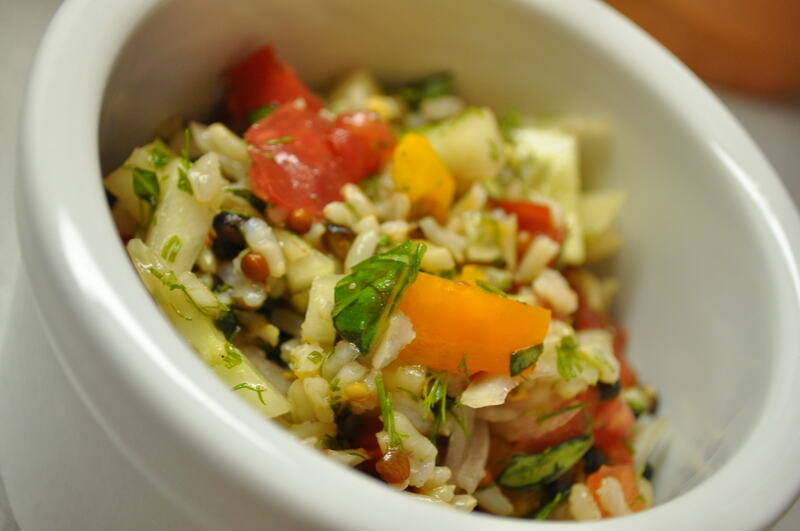 The program, now called CookShop, “gives low-income children, adults and teens the knowledge and tools to adopt and enjoy a healthy diet on a limited budget.” This recipe is adapted from Brown Rice & Tomato Salad. Serve warm or cold, for dinner or lunch. In a medium saucepan, bring water to boil. Mix in rice and salt and bring back to a boil. Reduce heat to low, cover and simmer until rice is tender and water is absorbed, about 50 minutes. Meanwhile, whisk vinegar and sugar together in a small bowl. Gradually whisk in oil. Set aside. 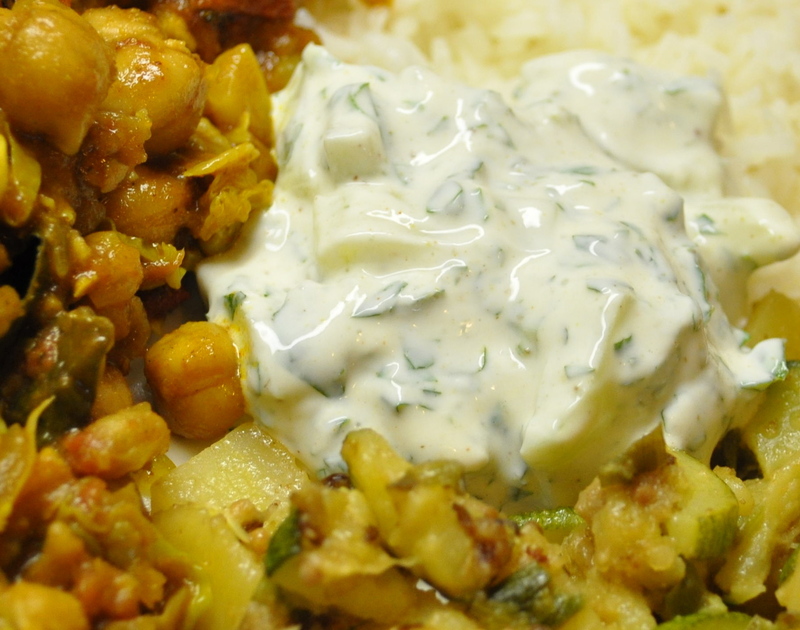 When rice is done, toss with dressing, tomatoes, cucumbers, herbs, onions and pepper. Combine all ingredients and a large bowl. Mix well. Combine all ingredients in a blender (reserving 2 tbsp minced scallions and 2 tbsp minced cucumber). Puree until smooth. Before serving, top with 1/2 tbsp reserved scallions and cucumber. After looking at several falafel recipes, I created my own. This recipe makes a delicate, but flavor packed, falafel without being deep-fried. I highly recommend using dried chickpeas (as opposed to canned), which gives a nicer texture and ensures the falafel cooks through completely, resulting in a perfectly moist end product. By forming the falafel dough into patties instead of balls you also ensure even cooking when using the pan-fry method, instead of deep-fry. Serve with pita, or other flatbread; tabbouleh; roasted eggplant, garlic, chickpeas and swiss chard; white bean hummus; tahini sauce; green salad; and tzatziki for a delicious vegetarian meal (omit tzatziki for a vegan meal). Place 16 oz of dried chickpeas in a large container with a tight fitting lid, add enough cold water to cover chickpeas by 2 inches, cover with lid and refrigerate for at least 24 hours. This should make between 4 and 5 cups of soaked chickpeas. Drain chickpeas well. Add 4 cups of soaked chickpeas to a food processor, and grind until finely blended (mixture will remain course). Add green onions, parsley leaves, cilantro stems and leaves, salt, and garlic. Blend until smooth as possible (mixture will remain slightly grainy). Add cumin, baking powder, cayenne, and flour. Blend again until smooth as possible. Transfer to a bowl and let stand, covered, for 30 minutes (note: you can also make the falafel batter a day ahead and refrigerate over night). Form falafel into small, 1 1/4 inch wide patties and arrange in one layer on a sheet of wax paper. Heat about 1/4 cup of extra virgin olive oil in a large, non-stick skillet. 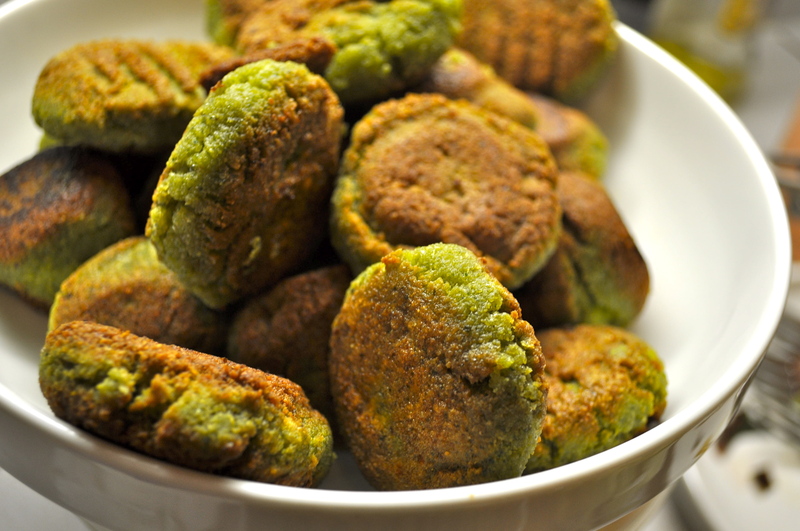 Pan-fry falafel patties in batches, turning once, until golden brown on both sides, 2-5 minutes per batch. Transfer to a bowl. Whisk (or using a food processor blender) combine all ingredients until well combined.